If you'd like to create a unique gift for someone special or you'd simply like to express your creative side, Genevieve's Gallery is the perfect venue for you. We offer a wide selection of plain pottery items just waiting for you to decorate however you'd like. You don't need to worry if you've never painted pottery before. No prior artistic experience is required. If you're not confident in your abilities, you can use one of our many stencils, sponges or transfers and we also stock a selection of books with plenty of ideas and designs to spark the imagination. If you need help, our studio assistants are always available to lend a hand. All you need to do is tell us your ideas and we'll do whatever you need to bring your vision to life. We'll then glaze your piece before firing it in our kiln ready for you to take home as a permanent reminder of your day. We are highly experienced in making sure that everyone who comes to our gallery has a great time and leaves with pottery they'll treasure. Contact us for further details or to arrange an event. 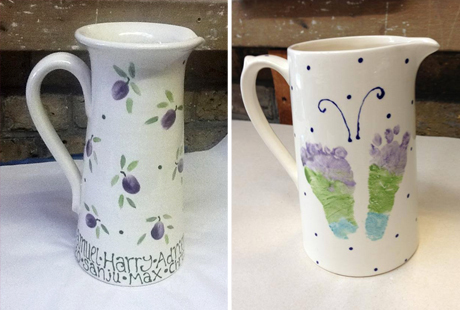 Pottery decorating is a fun activity for adults and children alike. Pop along to our gallery and discover for yourself! For walk-ins it's just £4 per person, plus the price of your chosen pottery and for out of hours it's only £5 per person, plus your chosen pottery. When you want to entertain the kids or you fancy trying something new, come to Genevieve's Gallery.